Over the years, Aardvark Antiques has come to sort of specialize in large, long dining room and conference tables. Many times, when customers are interested in buying a table, they will need advice on picking out the right table for them. We want all of our customers to be informed buyers, so we’d like to make this information available to everyone with 3 quick questions you can answer when in the market for a new table. Will you be mostly using it for entertaining or for family meals? Do you have fancy decor in your home or a more cozy motif? The answer to these questions will help you to decide if you need a formal or informal table. 2. How many will you be seating? Ask yourself what is the biggest group you’ll be entertaining. You might only have a family of four, but you may regularly have over friends or extended family and actually need a table that seats 12. If you have a situation like this, you may want to consider a small table that can be extended out with leaves. However, of you have a crew at the table on a regular basis, a bigger table will be what you need. 3. What shape do you want? Do you need a table that is rectangular, round, oval, or square? This will have to do with the space you have set aside for your table. Always remember that you need to leave at least 24 inches (60 cm) away from the wall on all sides so that getting in and out is easy. For consultation from our table experts call us at 770-534-6611. 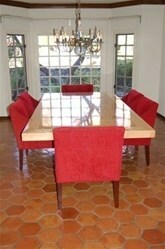 To view the finest formal dining tables at the best prices visit our website. 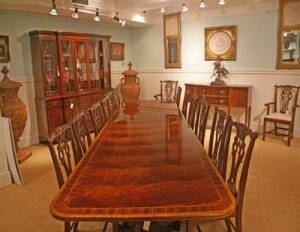 We sell near perfect fine furniture by Baker, Henredon, & Henkel Harris. You’ll find dining tables, conference tables & chairs by Stickley, Hickory Chair, Drexel, and EJ Victor 25 – 75% off.